…is the first solicitation for the revival of the ’70s Atlas publishing company…and…um, well. That’s certainly something. …Well, actually, that’s NOT where Colon left off, since that’s the second of three issues, but man, that’s a great cover. Anyway, this new Grim Ghost seems…well, I guess the problem I’m having is that it is new, and I’m having a bit of dissonance reconciling this modern-styled, muscled and vein-y Grim Ghost with the Grim Ghost stories of my youth. Now I know how all you people who got the vapors over the new [UPDATED VERSION OF OLD DC AND/OR MARVEL CHARACTER] feel. Though I do have to admit that, following the slight shock I had after first seeing it, this new version of the Grim Ghost has grown on me a wee bit. You know, from the one whole image I’ve seen so far. So I’ll give it a chance, I think…no idea how good it is on the scripting level, which means I’ll need to read it instead of just judging it by its cover. But I did really love that old Grim Ghost series, which at least earns this new series a chance from me (“he said self-importantly”). 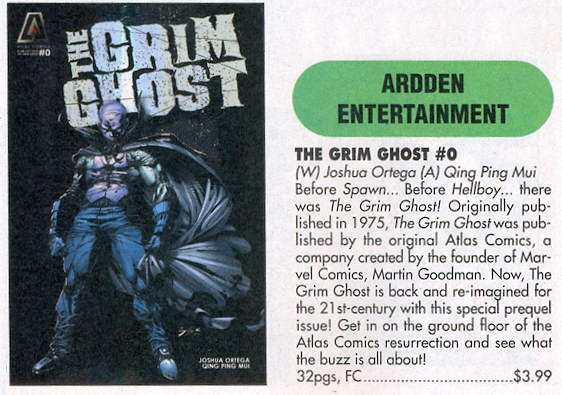 I do like that the solicitation explicitly calls out Spawn , given that Spawn’s origin shares some…similarities with the Grim Ghost’s. You know, bad guy dies, goes to Hell, swings deal with Devil to come back to Earth to serve as Devil’s agent, Devil sends him back to Earth, but years past the time which the “hero” was originally from. Okay, like only five years in Spawn’s case, a couple of centuries in Mr. G. Ghost’s case. However, if they revive Morlock 2001 , I sincerely hope the title stays as Morlock 2001 . Atlas? Really? There is so little imagination left in comics we need to resurrect dumb ripoff characters from a company that never managed to publish more than four issues of a given title? And Mr Justice had this schtick down pat decades before anyway. I saw that too, and as someone who has picked up Atlas books after the fact, I share a lot of your feelings. I think I’ll be ordering it too. What I want to see is a revival of LOMAX NYPD, and I know just the person to write it (not me). The original publication was originally published originally in published form by the original publisher and was a publication…originally. “Grim” is not the first word I would use to describe the dashing gentleman on the 1975 issue. I’ll check out the new one if only to encourage a revival of Planet of Vampires! I’ve never heard of it but I’m going to assume without clicking on the link that Morlock 2001 is about a morlock who reverse engineers the traveler’s machine to pursue him but has it break down a century too early (late?) and finds himself trapped in 2001. That’s the most 90’s cover I’ve seen since the 90’s. I remember buying the original GG books off the rack. Don’t have them now, but what I remember most about them was the Colon art. Heck I was even buying some of the Richie Rich adventure books that he drew. Just great stuff! He doesn’t really come across as “grim” on that second cover, does he? He seems to be more of an inner-looking, reflective Ghost, musing to himself philosophically about matters like what his collar’s attached to. Ol’ Grim’s looking pretty damn fabulous in the earlier cover. 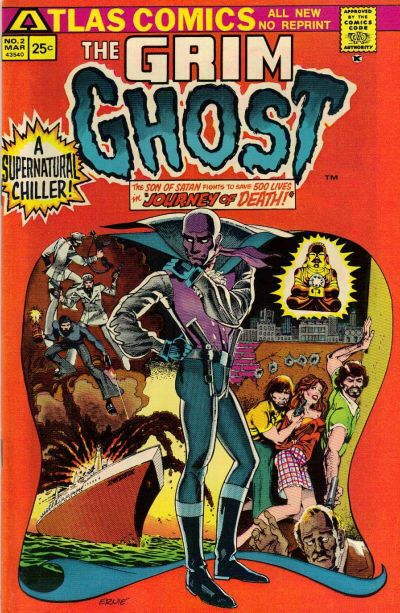 If I remember correctly, this character was originally called the GAY Ghost. …actually, that explains a lot. I am writing from the future. In the future, it is standard that all users browse the web using Internet Explorer 7.0.5730.11. And in the future, your lack of italics-closure-tag at the end of this entry make your blog look funny. Also, in the future, Progressive Ruin will be named president. Of the world. Awesome! Sorry for the close tag issue, pals.